Two new technologies in development and being tested by the National Library of Medicine may help transform the way hospitals keep track of patients during emergencies. The People Locator™ and the Patient Tracking and Locating System research projects are part of the public-private Bethesda Hospitals’ Emergency Preparedness Partnership (BHEPP). The projects, which began in 2008, are getting regular workouts and recognition. People Locator is an online “lost and found” Web site of people that can include name, gender, age, health condition, and photo when available that family members, emergency officials and others can search during disasters. It is part of the Lost Person Finder project, which includes several supporting applications such as ReUnite™, an app for smartphones and other mobile devices, and also shares data with third-party applications, including the Google Person Finder, to facilitate simultaneous searches of emergency sites by the International Federation of Red Cross and Red Crescent Societies (IFRC), and others. ReUnite first came into play during the January 2010 earthquake that devastated Haiti, and was NLM’s first downloadable iPhone app. Most recently, the NLM quickly set up People Locator for the 2012 Philippine Floods to help track survivors of the torrential rains in the Philippines that inundated Manila and surrounding areas. It was developed by the Communications Engineering Branch team at NLM’s Lister Hill National Center for Biomedical Communication (LHNCBC) consisting of Mike Gill, Sameer Antani, Glenn Pearson, Greg Miernicki, Leif Neve, and George Thoma, the Branch Chief. 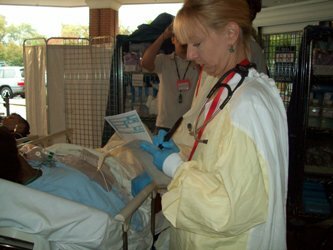 Staff at Suburban Hospital/Johns Hopkins Medicine triage “victims” during a disaster drill in 2010. A digital pen containing a small camera is used to record the medical information. The Patient Tracking and Locating System, produced by NLM’s Office of Computer and Communications Systems (OCCS) headed by Ivor D’Souza, consists of a commercial digital pen that captures patient information via a tiny camera; a Real-time Locating System (RTLS) featuring an ID badge (from Versus Technology), which can broadcast patient location and condition to care providers at a central location; and a software application devised by the OCCS to transfer patient records electronically from hospital to hospital. During disasters, D’Souza points out, following patients after initial triage is often difficult. They surge into care facilities then quickly transfer to other locations. The Tracking System provides accurate, real-time counts of patients needing immediate, delayed or minor care to a central emergency health command center, eliminating the need for follow-on contact and paperwork and streamlining timely care. What makes the Tracking System so versatile, says D’Souza, is its capacity to utilize third-party products that allow software-to-software communication. The system garnered a coveted HHSinnovates award in March 2012 and is notable for being “innovative in its scalability”– meaning it can support large enterprises, such as disaster management, or scaled–down local, non-emergency projects. For example, students of the Faculty of Medicine at Makerere University, in Kampala, Uganda, used a scaled-down version of the OCCS system that did not include the patient tracking system or the data exchange to study the impact of bed nets in protecting 300 families from malarial mosquitoes in a distant rural city, Mifumi. They collected house-to-house data with the digital pen and special digital paper, then uploaded summary information and detailed records for same-day review back at the university. D’Souza credits the system’s easy-to-use-technology with the project’s success. Similarly, the People Locator is finding success beyond its original disaster assignment. Recently St. Francis Hospital, in Indianapolis, Indiana, closed its old hospital, and with help from MESH (formerly known as Managed Emergency Surge for Healthcare, Inc.), an emergency preparedness healthcare coalition supporting area hospitals in Indianapolis, created a private People Locator Web site to monitor the transfer of patients to its new hospital. The site was accessible only to selected administrators. Departing patients, assigned nametags with their health status and the identification number of their ambulance, boarded the vehicle, and were recorded as “missing” by the People Locator. Upon safe arrival at their destination, they were listed as “found.” Travel time and ambulatory vehicle availability were also tracked and displayed statistics on a private Web site. The BHEPP formed in 2004, is developing a coordinated disaster response model for hospitals across the country. Both groups developing the technologies described here started work in 2008. The two applications have been tested annually since as part of the BHEPP Collaborative Multi-Agency Exercise (CMAX). The BHEPP partners include the NLM and three nearby hospitals: the National Institutes of Health (NIH) Clinical Center, which like NLM is part of the National Institutes of Health; Walter Reed National Military Medical Center; and Suburban Hospital Johns Hopkins Medicine, a not-for-profit community-based hospital in Bethesda, Md. The NLM’s Disaster Information Management Research Center (DIMRC), part of Specialized Information Services (SIS), coordinates NLM’s disaster research. Current projects also include the Military Affiliate Radio System (MARS) a back-up communications system for hospital emergency operations centers, and the Hospital Incident Command Center, a responder training research project that uses “virtual world” technologies.